A beautiful day of enlightenment, relaxation and inspiration for all the family. 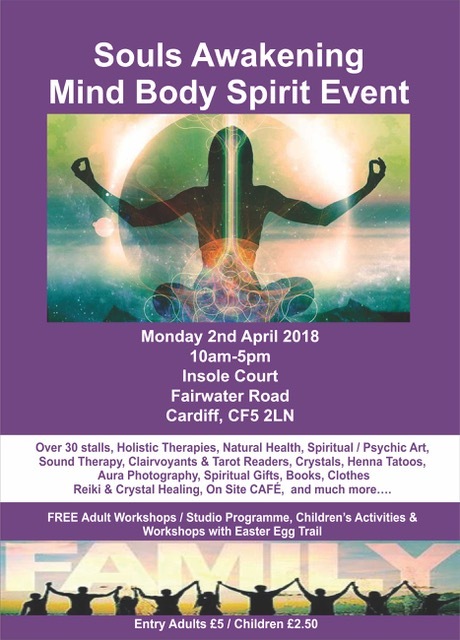 On the 2nd of April, Insole Court will welcome the Mind Body Spirit event. It will offer you selection of therapies, sessions and spiritual gifts. Enjoy exploring the magical grounds, picnic on the lawn or enjoy lunch at The Potting Shed Café. 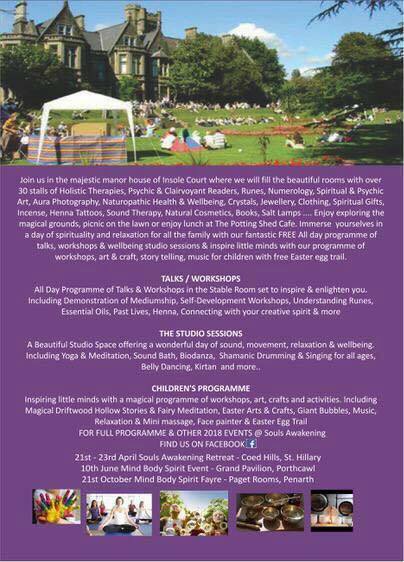 Immerse yourselves in a day of spirituality and relaxation for all the family with All Day Programme. Over 30 stalls of holistic therapies, natural health & naturopathy, clairvoyant & tarot readers, crystals, aura photography, books, spiritual & psychic art and much more. The All Day Programme of Talks & Workshops will inspire you by Demonstration of Mediumship, Self-Development Workshops or meditation. Visitors will also have the opportunity to try free sessions in the Beautiful Studio Space. Apart from traditional relaxation methods such as yoga or meditation, the Studio will show you some different techniques too. Lay down and relax during Sound Bath. This therapy uses vibratory healing frequencies from different musical instruments such as Tibetan Singing Bowls or Planetary Gong. If you don’t want to just lay on the floor, try some of the dancing sessions like Belly Dancing, Shamanic Drumming or Biodanza. Biodanza lets you to deepen self-awareness using music and movement. Series of exercise allows you to express yourself and fills your body with good feelings and positive energy. Children will definitely enjoy the free programme of Arts & Crafts. This programme includes Magical Driftwood Hollow Stories reading, Easter Egg Trail or Face painting. When children are tired, they can get some rest thanks to Fairy meditation or Mini massage session. Programme will be held at 10 am – 5 pm. Entry is £5 for adults and £2.50 for children, tickets will be sold in the place. Come and enjoy your day off full of relaxation and positive energy.